Yippee Hurray, it's done! Hendrix loves his new "Penwin pack-pack." 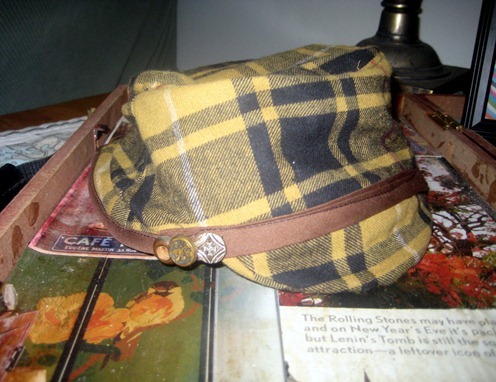 I used a fine-whale charcoal gray corduroy, some solids from my stash and two black buttons from a vintage button collection my mother gave me. On the inside, I used this odd green print that I don't love, but it's been sitting around too long and needed to be used. I do, however, love the red zipper I chose. I still want to add a zipper pull like some of you did, I think I might try something like this cute cuteness. 1. Holy hell, that was a lot of pattern pieces to cut out, especially since I interfaced every single thing. But my goodness, it was worth it because it's uber adorable. 2. Son of a beesting, I still loathe handstitching. Really not my strong suit. You can see my giant black stitches in the upper left corner there, so I'm guessing that's not a blindstitch. It took me two entire episodes of the Daily Show just to do one side. I'm the slowest ever. And that was after ripping out my first attempt and starting over. And after all that my fingers were bleeding... ok, that's a complete lie, I'm just being a wuss. Thanks for playing along everyone, this is really too much fun! A couple of weeks ago I was lucky enough to be a pattern tester for Vanessa of Little Big Girl Studio. I "met" Vanessa back in February when we both won new Brother sewing machines in the Prudent Baby potholder contest. She is definitely one of those bloggers who I know would be cool to hang out with in person. And she has come up with one of the most creative bag designs I have seen in a long time! Seriously, how cute is this bag? 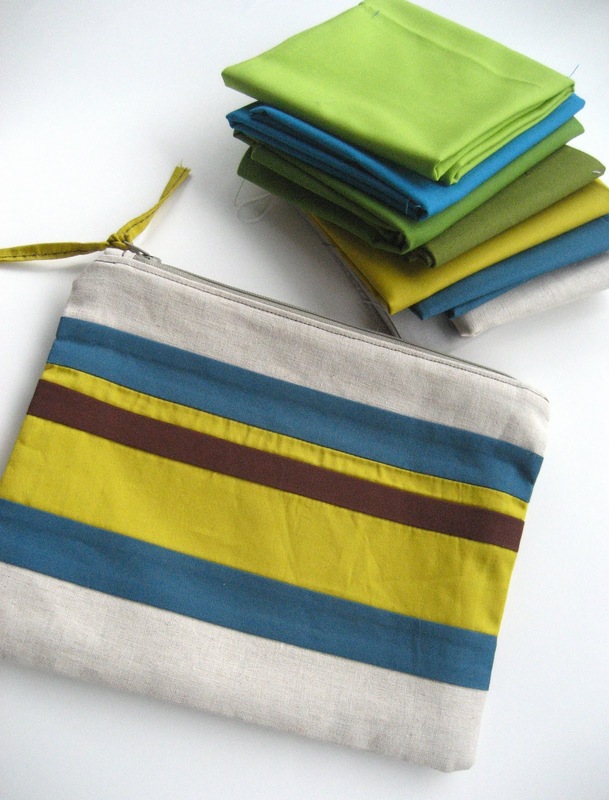 The pattern is called the Convertible Clutch because it can be carried two ways- as a clutch or a tote. Brilliant. I used Whimsy Gray Flower Mosaic for Henry Glass on the outside and Robert Kaufman Remix Zig Zig for the lining. The pattern has a pocket inside and also adds a magnetic snap, though I did not. 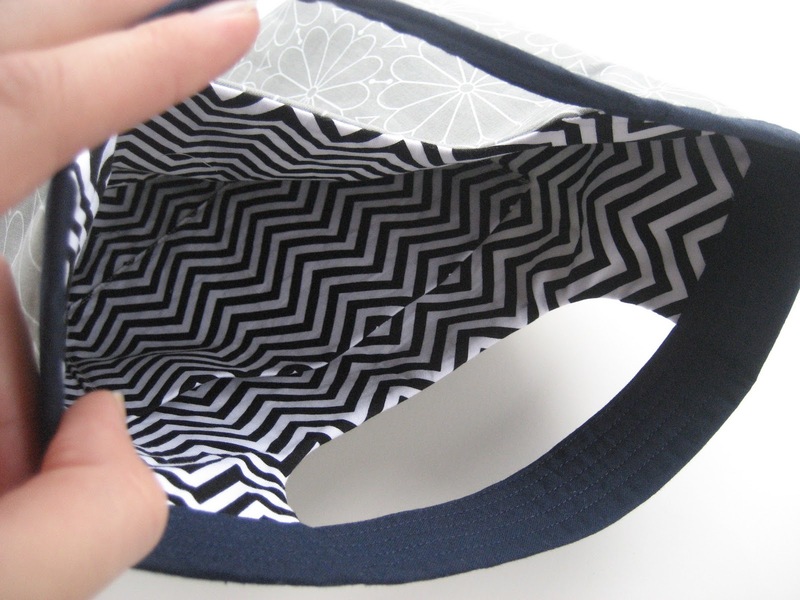 The pattern is great to follow and the bag has a nice sturdy shape. I love my new clutch/ tote! 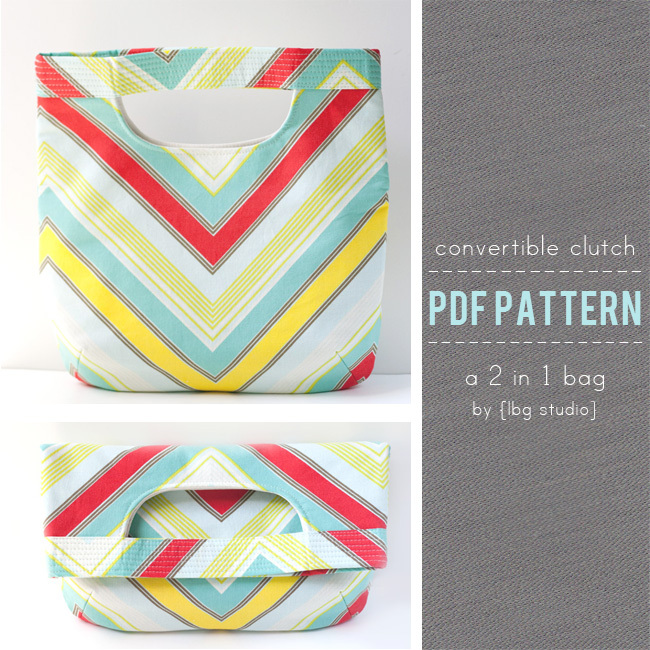 Find out more about the pattern and purchase right here. 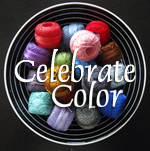 Vanessa has graciously offered to give the pattern away to one of my readers. 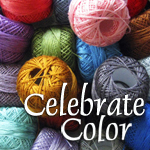 To enter, just leave ONE comment telling me the best pattern or tutorial you've tried recently- Because I really want to know! Make sure your profile has your email, if not also leave that in your ONE comment. I'll keep the giveaway open until this Saturday night, then draw a winner. Good luck! A couple weeks ago, it was my friend Julie's birthday. I work with Julie at Sewn Studio, so I got to make a gift for a sewing friend- someone who can really appreciate a handmade gift. Not that other people don't appreciate very much my handmade gifts, it's just different getting to sew for a sewer. 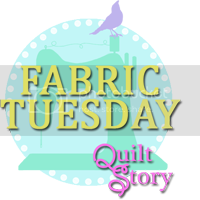 It's really fun because you know they will appreciate your thinking in fabric choices and things like quilting styles. Also, Julie is just an all around fantastic person, so that made this gift even more fun to make very late at night. I decided that an "organic" wavy line style would look good with this design. It was actually harder to do than I thought. It's much easier to just make straight lines, but I still really like the look. One side is cool and one is spicier. It's funny how much I love this Lizzie House print in brown because I'm normally not drawn to brown fabrics. I think I may have to get more. And the binding is that yellow Annie's Seed Catalogue which I also might need more of. I can't wait to use the red that I have in that on something special. I just used my machine as a guide to make it, and it came to about 17" by 28." 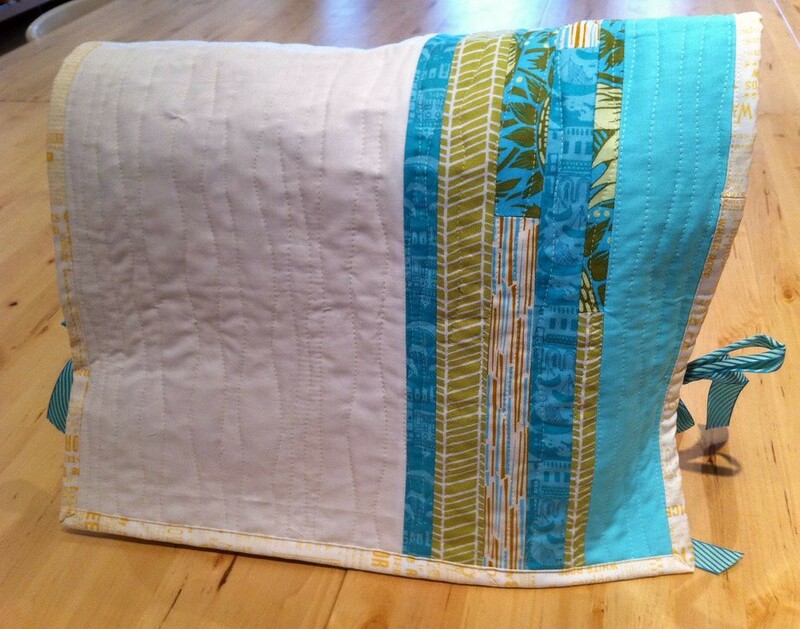 It was a really fun little last-minute quilting project. .... or you know, from the last two months. Just wanted to do a little showing off of some really special and creative things you guys have added to your projects. It's really cool to see all these different takes on the same simple patterns. YOU GUYS ROCK. Also, don't forget that the backpack link party will go up this Friday, September 30. I'll keep it open an extra week so everyone has a chance to catch up and add their project, then I'll do the drawing for the FREE Oliver & S pattern of the winner's choice (currently in print, of course.) 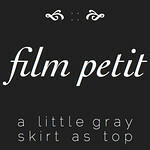 Make sure you add your post even if I am showing it off here, and if you are playing along on flickr, I think you should be able to link your photo url, but if you have trouble just email me. Remember, messenger bags or any other project from the book counts. I'm sure you've probably seen Anne's adorable girlie penguin backpack, but I just had to make sure! She added a squeaker in the penguins nose (so it sounds like Pingu!) 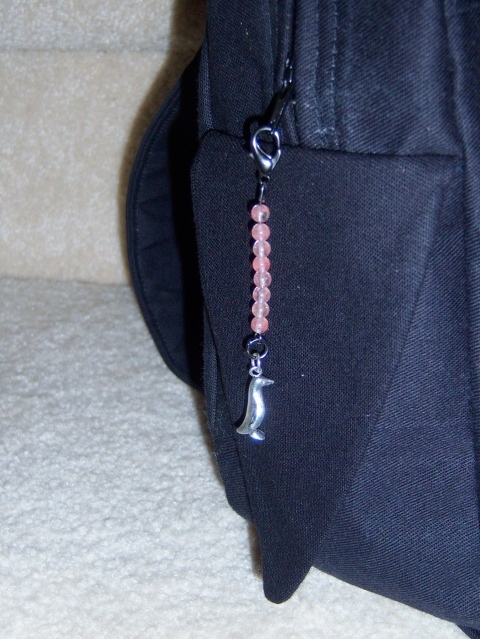 and a beaded zipper pull. I'm definitely adding some type of pull to mine now. Love it. Tara added a really sweet tree applique to her backpack. Love how the bright reds pop!. 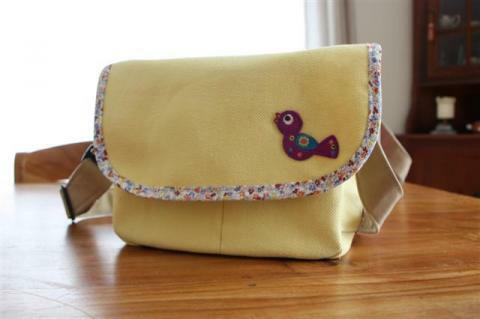 This perfect little bird applique took it's cues from seeing this fun squirrel bag. Great to see some messenger bags and some shared inspiration. Everyone's hats last month were so unique and well-done. 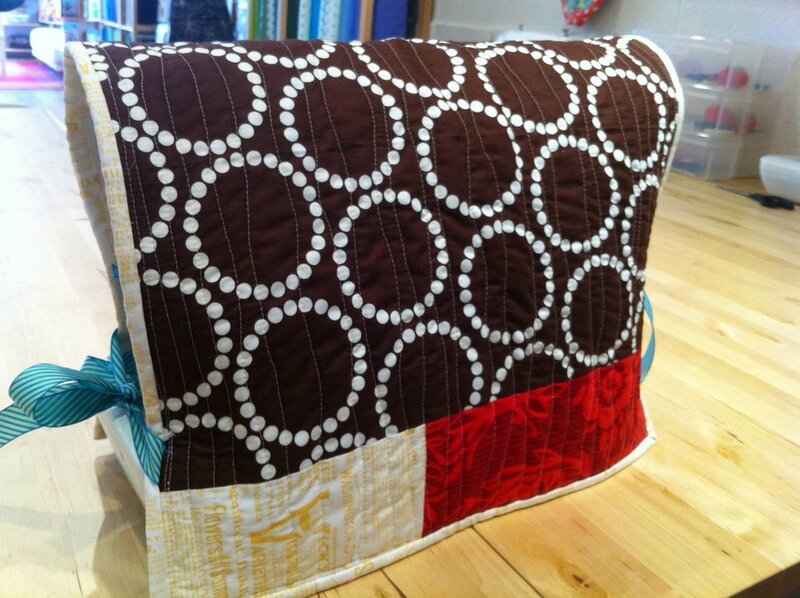 I really like the way Sarah added this cute boy-ish patch and contrasting topstitching. 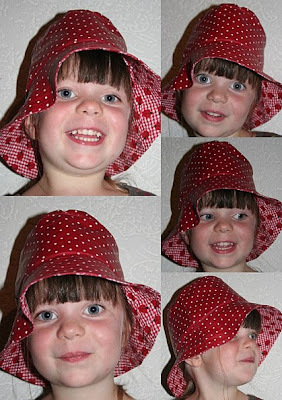 Liv added a bit of velcro to her daughter's hat so she could switch out bows and embellishment, and she really got creative on her son's hat by changing the brim shape entirely. Love the vintage military-inspired look! A few friends having babies= a few baby gifts to make! Baby stuff is so fun to make because A. 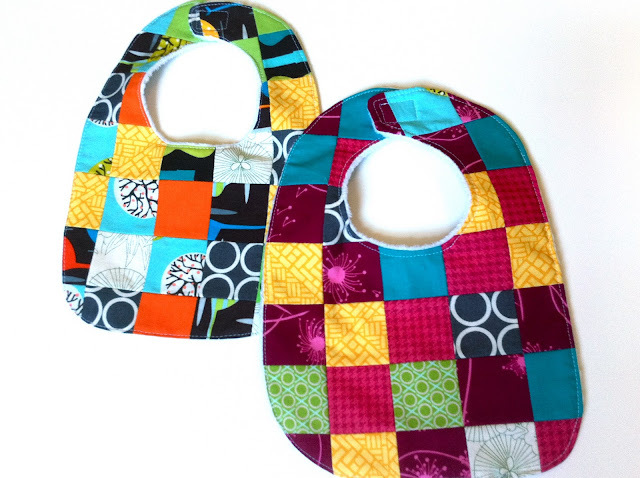 There are a bazillion cute projects and cute fabrics to choose from and 2) I like to give gifts to the parents that are a bit off the beaten path from the baby shower norm. Of course, that's why I like handmade for any kind of gift I guess. Ever since I made this swaddler (free pattern here) for Elsie, I have known that every newborn needs one. Or more accurately, every parent of a newborn needs it. It's like a sleep genie. So after making three swaddlers for three babes, I had a lot of minky left over in odd shapes. 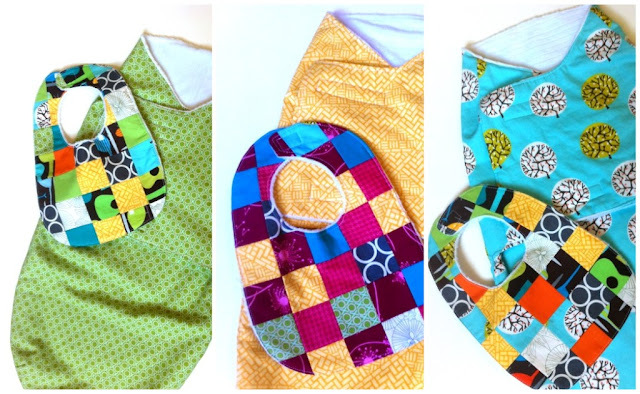 I took one of Elsie's bibs and made a pattern for these, backing them in the minky and attempting some fun scrap-busting on the front. 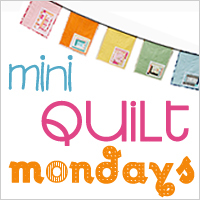 Making enough of that 2" square patchwork (postage stamp?) 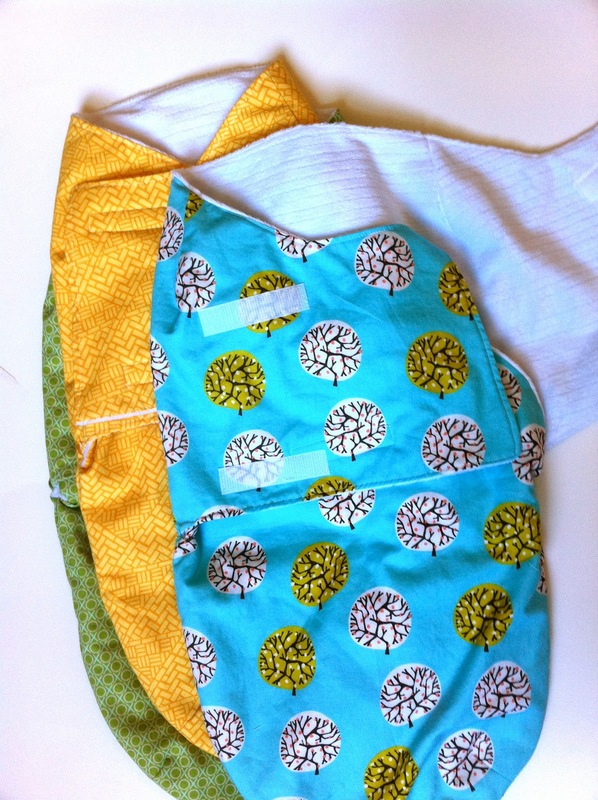 did take a little while, but it was the fun, methodical, mindless kind of sewing that is very refreshing sometimes. And I think the results are pretty cute. There was even one girl version left for Elsie- see, she does get something made for her once in a while. Three fun baby packages all mailed out to sweet born babes or babes to-be. Do you like making baby gifts? 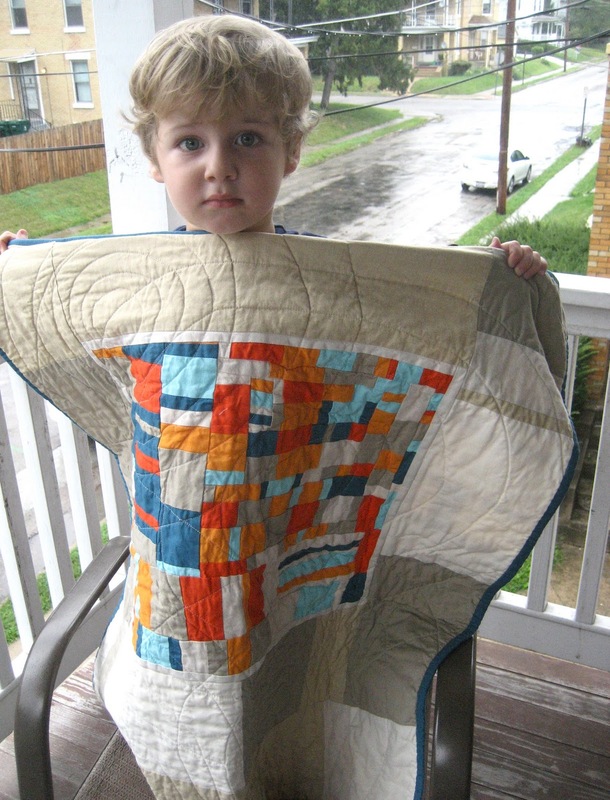 What are your go-to infant projects? Not that you do swaps just for the goods. But that's a big part of it. And I made out like a bandit this week! First, in my "For the Love of Solids" swap (I made this) I got the most wonderful package from Anna of Woollykat. I was like a kid on Christmas morning when I opened it and saw this quilt inside. I had been blown away when I saw it pop up in the flickr pool. Turns out, it was custom made for me! 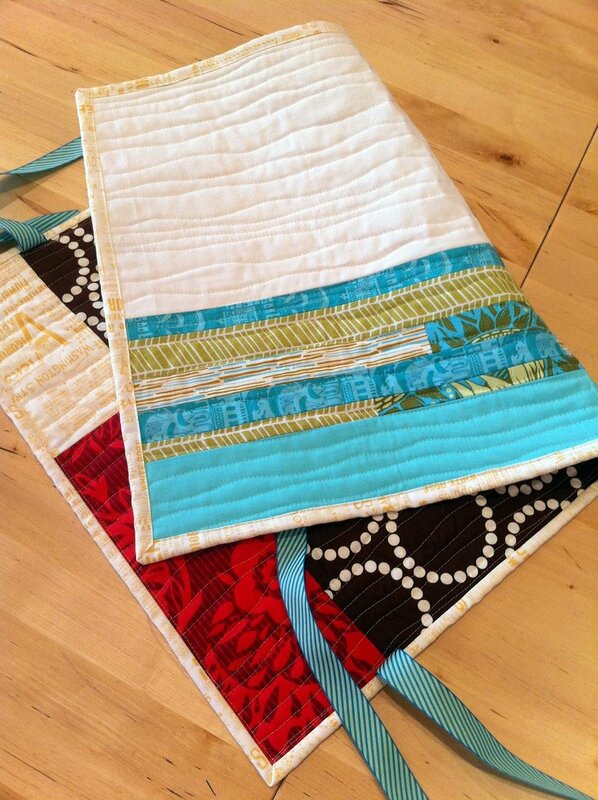 In my swap survey, I said I loved wonky and improv piecing as well as the use of linens alongside bright colors. She really delivered. Thank you so much Anna!! 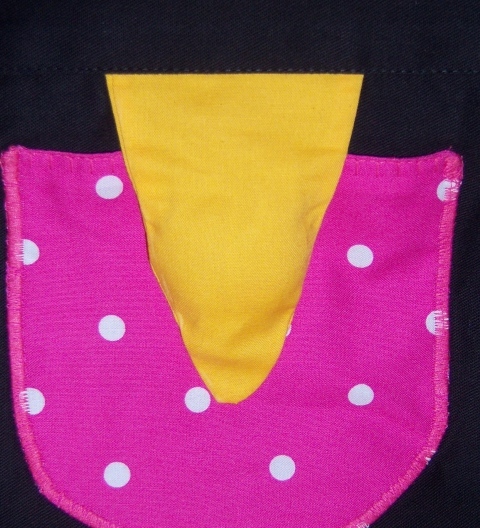 She also took the time to make this pouch in the most perfect color combo, and send all those solids for my stash. I'm sure you guys will be seeing those put to good use soon. 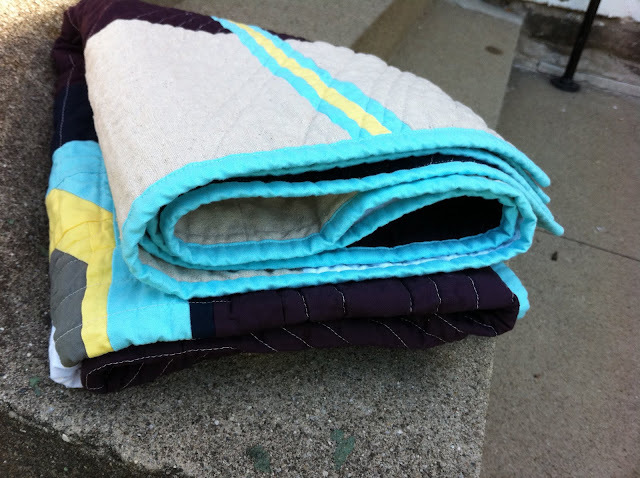 I also went to my second Cincinnati Modern Quilt Guild meeting this week and we swapped mini quilts. 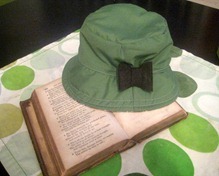 (I made this one for the swap.) I got this adorable piece by Amy. 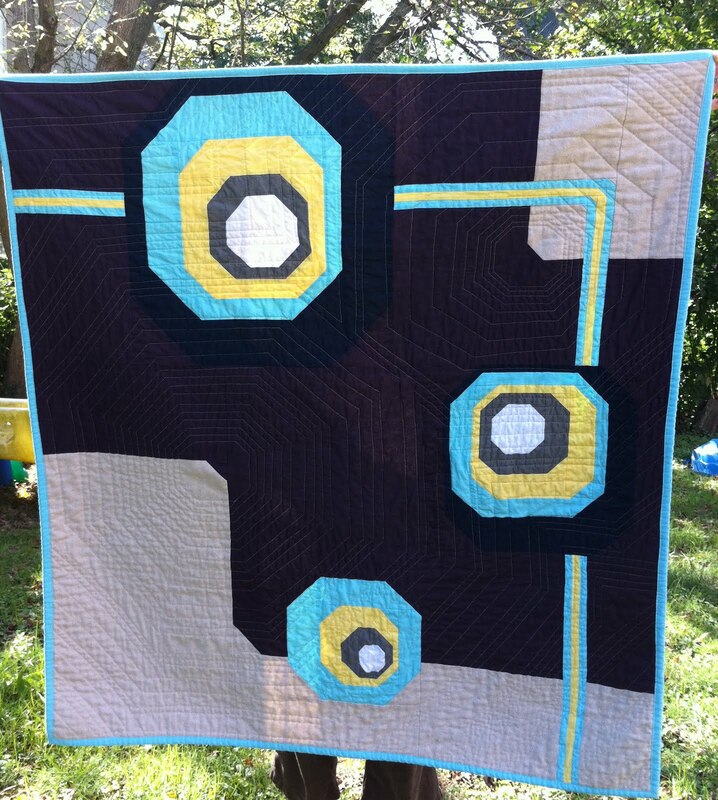 I love the bright colors and the solids she chose. I also love anything in that diamond shape. Anyway, there is really only one point to make this week. Why do the judges/ producers hate Viktor? while Josh made this (throw up in my mouth a little) and got wildly praised. But this dress by Anya (cute, but whatever) took the win. but Josh made this dress (zzzzz...) and won again. Oh Viktor, you are so naive. 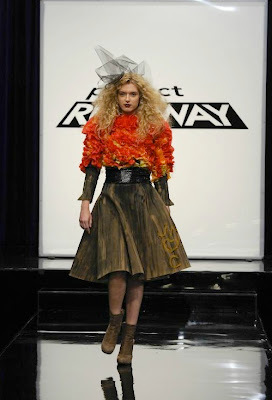 Did you think you would win Project Runway with talent? If only you were beautiful and exotic like Anya, or maybe a huge turd sandwich like Josh. Oh, this quilt. It was a roller coaster of loving it, hating it, hating it some more, then really loving it, then sending it off to a new home. It was supposed to be a mini. It ended up about 46" by 48". Whoops. I guess that's what happens when you stray from your original plan. It's hard to tell in the pictures, but there is an outer ring of navy around the off-centered snowballs, and then the background is a dark purpley-maroon called "grape." I'm actually kind of hating these pictures now because it all looks close to black. There is no black, just more navy and grape on the back. It's now on the way to my partner in the For the Love of Solids swap. I'm really hoping she loves it and doesn't hate getting a much bigger item than she anticipated. I just got excited about my off-center snowball idea (which I don't remember seeing anywhere else before, but I'm sure someone has done it), and I needed to make it big enough to have that empty space along with the balls. And then I decided it needed that linen to soften it up because it was looking so dark and modern. I have no idea what that linen is, I have an obscene amount of yardage that someone gave me a while back. But I love the balance it adds. 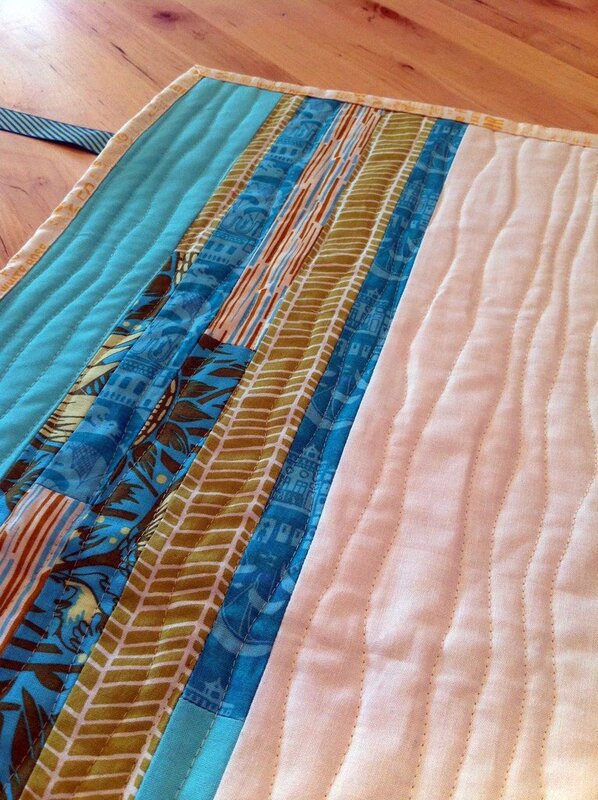 The quilting is my favorite part. At first I thought I might regret choosing a light thread on all that dark grape, but after it crinkled up in the wash I absolutely loved the effect. It echoes the shape of the blocks, but begins in two emptier spaces, rather than matching up perfectly with the snowball block sections. I also really love the cheery blue binding. 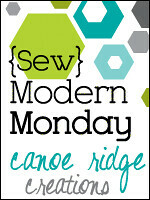 This was my first Flickr swap and I enjoyed it so much. There were definitely moments (1 a.m.-ish moments) when I thought, "why did I sign up for this again?" But having the specific challenge and timeline set out made me create something I love that I wouldn't have made otherwise. And I learned a ton about design and improv piecing. Now I cannot wait to see what I get in the mail in the next day or two!